However you want to classify it, the tomato is a super food with incredible health benefits. So it may come as another surprise to learn that it in the 17th century it was considered poisonous—or at least unfit to eat—in Britain. That wasn’t an entirely crazy idea: tomatoes are in fact a member of the nightshade family (Solanaceae), which does include some toxic species. But today there are thousands of tomato cultivars and it has become one of the most popular vegetables—make that fruits!—in the world. 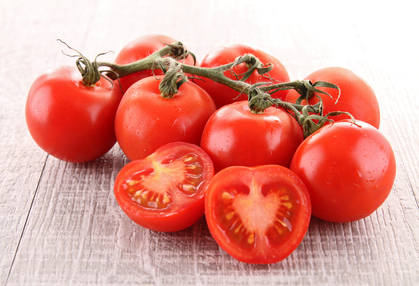 Lycopene is an antioxidant found in very high concentrations in tomatoes. It’s a type of plant pigment called a carotenoid, and it’s also present in carrots and red peppers. Lycopene enters your blood, liver, lungs, colon and skin, protecting these tissues and organs from cancer. Studies have also correlated high levels of lycopene and carotenoids with lower incidence of heart disease and age-related macular degeneration, which affects your eyesight and can cause blindness. Tomatoes are also great sources of vitamin C, folate and potassium, all of which play an important role in human health.